You might be a casual photographer looking to read about the best DSLR Camera out there or you may be a professional photographer looking to add another piece of photography equipment to your arsenal. Whichever category you might belong to, you have come to the right place. We will guide you through the jungle of DSLR madness and help you choose the best DSLR Camera for your purpose. DSLR which stands for Digital Single Lens Reflex is a type of Camera that has removable lenses which allow you to customize your viewing experience. You are not limited to a single type of photography style with a DSLR. Since it allows you to attach your own lenses to the Camera, You often find this type of Camera being used by professional photographers. This gives them a chance to take a sharper and customized photo. Also it a gives you the option of hands on Zoom control for focus & precision. We will try to update this guide as often as possible with new DSLRs, features, price updates. So you might want to bookmark this page on your browser for quick access. 3 Which is the Best DSLR Camera in the market today? Lens Mount – A Lens Mount is an interface (mechanical and often also electrical) between a photographic Camera body and a lens. Different Camera manufacturers use different Lens Mounts for Eg: Canon uses an EF Lens Mount, Nikon uses a F-mount. Sensor Size – This in simple terms determines the amount of light the DSLR will use to create an Image. The bigger the sensor size the better the image quality. Equivalent Focal Length – The Focal Length of a lens is the distance between the optical center of the lens and the place where it focuses its image. For a DSLR, It is the Imaging Sensor (usually a CCD Array). The term “Equivalent” is typically in relation to older 35mm film. Which most photographers are familiar with. Megapixel – Megapixel means one million pixels. The resolution of digital Cameras is often measured in megapixels. While many think that the more is better in terms of Megapixels, I don’t find this quite appealing considering that there are tons of other factors that come into play when taking a photo. But for the general public I guess Megapixel does play an important role when choosing a DSLR. ISO – We need to take into consideration about two eras when talking about ISOs. Traditional Film Photography – ISO in the older film photography was the indication of how sensitive a film was to light. It was measured in numbers like 100, 200, 400, 800 etc. Digital Age (DLSR etc.) -ISO measures the sensitivity of the image sensor. The same principles apply as in film photography. In ISO, The lower the number – The lesser sensitive it is to light and the finer the grain becomes. 100 are usually what most photographers go with but many like to set it to Auto wherein the DSLR chooses the ISO automatically according to the surrounding conditions. Which is the Best DSLR Camera in the market today? Instead of choosing a single best DSLR Camera, I would like to give you 5 options to choose from. Don’t worry I will help you choose the right DSLR for the photographer in you. I am giving this option so that you are not left without choices. I can tell you that whichever one you choose to buy, it will be worth the money you spend. So let us find out the best DSLR Camera out there. You can click on the title to visit the product page on Amazon.com, Where you can find the latest price and possibly a huge discount with free shipping. The Canon EOS Rebel T3i which is also known as the Canon EOS 600D (in Europe) is a successor to Canon’s EOS550D and borrows many of its good features, such being Beginner Friendly. The Camera has an Articulated Screen with HD Recording. Features a ‘Basic+’ feature which is a beginner friendly, results oriented approach to image adjustments in the scene based exposure modes. It allows a photographer to adjust the background blur and changes the look of their images in real time without the photographer having to know all the technical aspects. You can also control the Camera wirelessly for off Camera flashes and such. Exposure mode has also been updated to ‘Scene Intelligent Auto’ which analyses the image in front of the Camera and adjusts the exposure and image processing parameters, even tweaks the color output automatically. To help Beginners get the feel of DSLR, Canon has introduced a ‘Feature Guide’ that displays short explanations of each function on the screen. Make use of this if you don’t understand any of the technical jargon. There is a ‘Video Snapshot’ movie mode that has been borrowed from the Canon range of Camcorders. This allows you to produce complex and multi-take movies without the need of a computer editing software. The Canon EOS Rebel T3i has a 18MP APS-C CMOS sensor along with its sensitivity range of ISO 100-6400 (expandable to 12800). The Camera has a 3.9fps continuous shooting along with the 9-point autofocus and 63 zone metering systems. This Canon DSLR is offering full HD recording via a dedicated position on the Camera’s mode dial, with full manual control available for advanced users. There is a new digital zoom function, offering 3 – 10x magnification, and the 600D also has sound recording level control built-in, with a stereo sound meter to help judge the right setting. 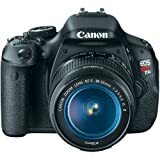 The Canon Rebel T3i comes with kit lens, The EF-S 18-55mm F3.5-5.6 IS II. This Lens kit is normally what you will need for the day to day photography but advanced users may use from their own collection or buy new DSLR lenses. The Nikon D3200 is an excellent Entry Level DSLR for beginners. This feature packed and affordable DSLR is perfect for most starters who are looking to buy their first DSLR. Nikon D3200 comes with a Lens Kit, Which is suitable for most photography assignments. It has a 24 Megapixel CMOS Sensor. The Sensitivity levels range from ISO 100-6400 (plus ISO 12,800-equivalent Hi1 setting) which is common with most of the entry level DSLRs. This Nikon Camera comes with a Full HD 1080p/30p video (with 25p and 24p options) recording option but unfortunately the Photo Filters are not available but that is not a necessity considering that we have wide variety of options in terms of Mobile/Desktop software. After all its post capture processing and that doesn’t count as a DSLR setback in Nikon. The Microphone Socket is pretty sensitive and that is a good thing when recording videos on DSLRs. There are Twin IR Remote Receivers on the Camera. Along with Full 1080p HD recording the 4fps recording feature makes the videos crisp. For beginners there is a guide mode on the DSLR mode dial. For Wireless transmission, Nikon offered an additional Wi-Fi transmitter for the Camera later on. This transmitter also known as the WU-1a attaches itself to the USB Socket. After the Wi-Fi transmitter is clipped on to the DSLR, You can broadcast its images and videos to Smartphones and Tablets (or even PCs with a bit of tweak – Bluestacks) running the Nikon App. With the Wi-Fi transmitter, The Camera allows live view output to be streamed to the Nikon App enabled device. You can capture images/videos remotely with the Nikon App up to a distance of 49ft. But unfortunately the app doesn’t allow control over the DSLR’s settings. The maximum image resolution goes up to 6016 x 4000 which yields pretty heavy sized (MB) of images and videos. The Camera runs on an Expeed 3 processor with the CMOS type sensor as I told earlier. There is no Image Stabilization but there is Custom White Balance and the JPEG quality levels range in 3 options: Fine, Normal, Basic with Fine being the highest quality. There is Auto Focus and a Focal length multiplier of 1.5x with Manual Lens Zoom. The Lens Mount is an F Type. The storage types supported are SD/SDHC/SDXC UHS-I compliant. And the connectivity is USB 2.0 (480 Mbit/sec) and HDMI (Mini type C). The Canon EOS Rebel SL1 also known as the EOS 100D is billed as the world’s smallest, lightest APS-C DSLR and it’s quite true. The form factor of this Canon DSLR is quite sturdy and handy. The small form factor of the Canon ESO Rebel SL1 is achieved by cutting down on the Shutter Mechanism, replacing it with a smaller shutter mechanism, a thinner sensor module and a smaller footprint circuit board. It has an 18 Megapixel resolution with a DIGIC 5 powered processor. The processor is 14 bit. Canon has been able to retain most of its Rebel series features and controls while cutting down on size in the SL1 series. A front dial and dedicated ISO, exposure compensation and AF/AE lock buttons are among the controls on this handy DSLR. This DSLR features a Touchscreen with a fixed display instead of an articulated display like with other DSLRs. With the Rebel SL1, Canon has introduced V2 of its Hybrid CMOS AF System, The new version significantly covers a larger live view area. The DSLR has continuous autofocus in movie mode with subject tracking which is an awesome feature when recording movies with quite unstable terrain. The Sensitivity ranges from ISO 100 – 12800 (expandable to 25600) which is quite usual on most DSLRs. This is a sign that there has been no quality reduction with the size reduction. The video recording happens at 4fps with continuous shooting and 1080p HD Recording. Although there is a 1080p HD recording, The Audio input is Monaural Microphone (stereo input jack). There is also a 9 point Auto Focus (The central sensor is cross type). The SL1 has a lower capacity flash, with a guide number of 9m (versus 13mm on the 650D). With Canon Rebel SL1, They introduced the EF-S 18-55mm F3.5-5.6 IS STM lenses. This is the standard kit zoom for the SL1 and brings the total number of EF-S STM lenses to three, with a 40mm and 18-135mm. There is a Live View as usual with the Rebel series. Also what’s lacking in the Nikon D3200 has been added to the Canon Rebel SL1 – The ‘Creative Filters’. Though, as I said before it’s not a necessity but good to have. The Canon EOS 70D is a Mid-Range DSLR for photography enthusiasts. 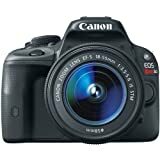 It borrows its features from its predecessor EOS 60D plus new features and additions. The EOS 70D has an articulated Touchscreen. Features built in Wi-Fi for remote control. The Camera comes with a 20 Megapixel resolution and uses a ‘Dual Pixel CMOS AF’ design in which every single pixel is split into two separately-readable photodiodes, facing left and right. The above said feature renders the DSLR capable of phase detection autofocus in live view and movie mode. Similar to most DSLRs the EOS 70D uses a 19 point Auto Focus sensor for viewfinder shooting with simplified control options in its firmware as compared to the EOS 7D. It can take shots at 7fps for up to 65 frames in JPEG or 16 in case of RAW format. As usual the Sensitivity ranges from ISO 100-12800 with an expandable option of up to 25600. The processor is a DIGIC 5+ processor. It implements clean control mechanism like any other Canon counterparts with a Quick Control screen that covers pretty much anything left. There is a silent shutter mode on the Camera which pretty much speaks for itself. The EOS 70D has 1080p/30p video recording and the stereo sound via external microphone. In terms of storage it supports a Single SD/SDHC/SDXC card slot. There are a bunch of other features thrown in such as the ‘Creative Filter’ and In-Camera HDR and Multiple Exposure modes. There is a Built-in flash that works as off-Camera remote flash controller on this DSLR. The highest priced kit comes with an EF-S 18-135mm f/3.5-5.6 IS STM lens. The Nikon D5300 is an Advanced Beginner DSLR which is a successor of the Nikon D3200 which we reviewed before and the Nikon D5200. The DSLR looks similar to the above said predecessors but has increased functionality which is easily visible with a few minutes of use. The Camera has a slightly widened (3.2″ compared to 3″) fully-articulated 1.04 million-dot LCD screen on the rear which will be pleasing to both videographers and photographers alike. The D5300 has more physical controls as compared to the D3200. Also the DSLR has a 24 Megapixel resolution DX format CMOS sensor which lacks Anti-Aliasing which gives it an edge in terms of resolution as compared to the Nikon D5200. This boasts improvements in image quality. The video recording has been beefed up with a Full HD 1080p/60p HD video recording with 5fps continuous shooting. It has built in Stereo microphone. The DSLR has built in Wi-Fi and GPS which enables geo tagging of images and remote Camera management with the Nikon App on Smartphones and Tablets (also on PC with bluestacks). The battery life gets a boost as compared to its predecessors with an endurance of 600 shots as compared to 500 shots of Nikon D5200. The Sensitivity ranges from the usual ISO 100-12800 and expands to 25600. There is a 39-point AF system which is 9 sensors cross-type. Also it has a 2016-pixel RGB metering sensor. I hope you enjoyed our pick of the best DSLR Camera from the wide range of DSLR Cameras available in the market today. The ones we chose are the best DSLR Camera of 2014.